Have you ever had a nightmare in which animals escape from the zoo, and are upset about their maltreatment and charge around the zoo in a mad frenzy? In Dushanbe, this happens. Sort of. On Saturday, we went to the zoo. My friends had already been, and warned me against it, but I was insistent. It is The Most Depressing Place on Earth. Only in Dushanbe would the “reptile house” consist of a bunch of cages filled with dead snakes. 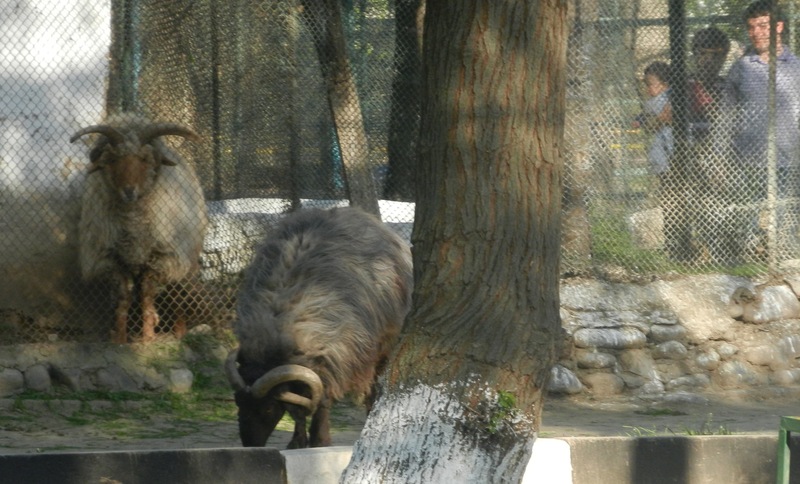 Only in Dushanbe would a house cat qualify as a zoo animal. Only in Dushanbe would it be appropriate to keep two bears in a tiny enclosure about half the size of my bedroom. The whole place is filled with the howls of forlorn animals. 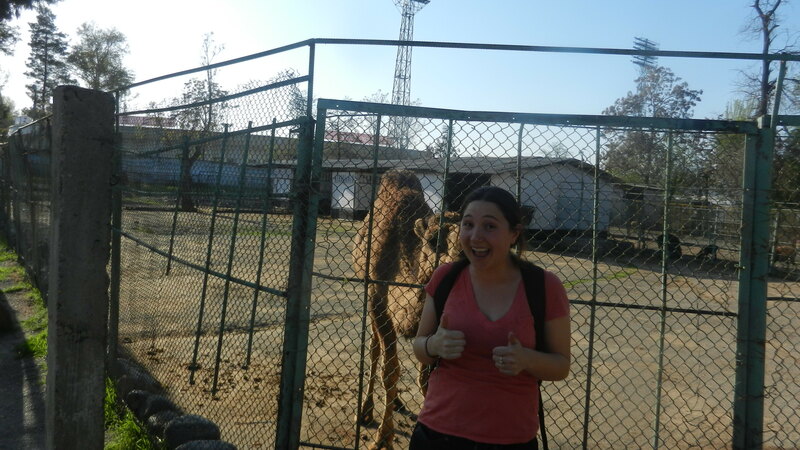 I’ve never felt particularly strongly about zoos, but the Dushanbe zoo Should Not Be Allowed to Exist. And then, just when we thought it couldn’t get any worse, we saw one poor ram, desperately trying to get out of his enclosure. “It looks like it might escape,” I said. And then it escaped. It mostly looked confused about its newfound freedom, and I’m sure they sent someone to put it back in the cage and duct-tape up the hole soon enough, but we didn’t stick around to find out. Escaping Ram! Watch out before it rams you. Alright, enough with this depression. Sometimes bad things happen to good rams. Lets move on. On Sunday, I wanted to walk. I like to walk long distances. I particularly like to walk between cities or towns. So I decided to walk to Varzob, the village where we often go for hiking or relaxation by the river. Spoiler alert: I didn’t make it all the way there. After walking for about 2.5 hrs. my friend passed me in a mashruka (share van), and I decided it was time to hurry up and get somewhere, so I caught a ride the rest of the way. But I wasn’t particularly concerned about making it the whole way. It was just wonderful to get out of the city, and see some villages. I rode the bus out to the edge of the city, where it turns back into the collection of small villages it really is at heart. Dushanbe, for those who didn’t know, was founded in 1924. Before then, “Dushanbe” was a village of about 215 people. Where the city sits now was a collection of 10 or so small villages. The other bit of excitement this week was teaching English at the National Library. The National Library was supposed to open in September. But it didn’t. It opened last month. Which, given that this is Tajikistan, is actually pretty much on time. The English class that Joey and I teach through the U.S. cultural center was moved there. The weird thing about the Tajik National Library is that I didn’t see any books there. I’m told they do possess books. In fact, I know they do, since every school child in Tajikistan was required to donate 5 books to the library (this policy is exactly as terrible as it sounds). But I’m going to have to go back and search for said books. The Tajik National Library also has an escalator (the second in Tajikistan as far as I’m aware) but its not yet in operation. Me: “Amanda.” (Usually I Tajik-ify my name to Umida, but I forgot this time). Me: “Erm, yea sure, Commander. Driver: “Did you know that Commander is Russian for ‘Farmandah? '” (That’s Tajiki for Commander). wherever it flows it wilts the blossoms. This entry was posted in Uncategorized and tagged dushanbe, Farsi, libraries, long walks, Persian, Poetry, rams, Shams Tabrizi, Tajiki, Tajikistan, Travel, varzob, Zoos. Just teasing. haha Our Zoo is a true showpiece !! !